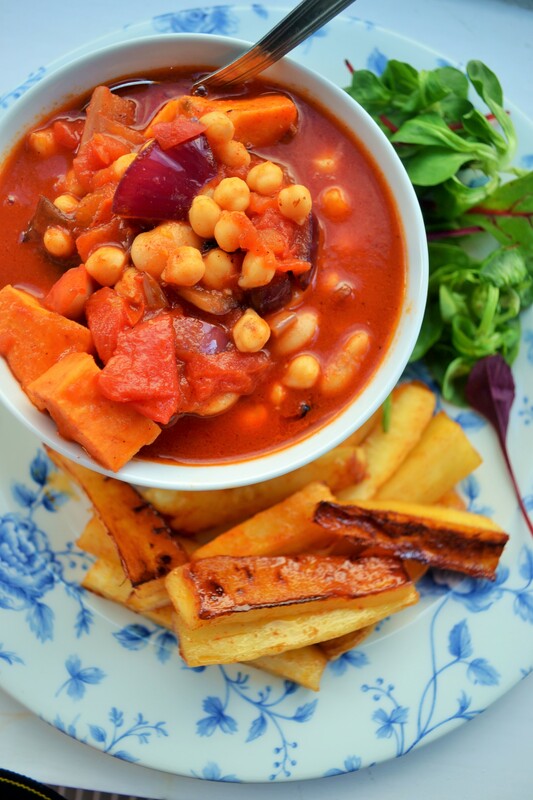 A great winter warmer or packed lunch that is vegan and free from most major allergens! 1. For the parsnip chips, chop up the parsnips into long ‘chip-like’ shapes. Turn on the grill. 2. In a small bowl, pour in 3 tablespoons of olive oil, 1 teaspoon of paprika, and 2 pinches of salt and mix. 3. On a baking tray, line up the parsnips evenly, and drizzle the olive oil and paprika mixture on top evenly. Place under the grill. 4. In a microwave proof bowl, place the chopped sweet potato into the microwave and cook for 4 mins.While these are cooking, heat up a saucepan and add a little olive oil. Place the chopped onion into the pan along with the garlic. 5. While this cooks for 2 mins, turn over the parsnip chips so that they are cooked evenly on all sides and golden looking. 6. Add the tomato, chickpeas, butter beans, tablespoon of paprika and cooked sweet potato to the saucepan and cook for 5 minutes at a medium heat. You can remove the parsnip chips when fully cooked as this is being done. 7. Once the bean mix is heated up, remove and serve immediately. Place the parsnip chips alongside the bean mix and enjoy!